Production. The term means different things to different people, but for analysts at PFF, it’s the definition of what we try to quantify in our play-by-play grading. Performance-based analysis is the best description for our grading system, and the word “production” means far more than just stats. For pass-rushers in particular, the PFF system credits defenders for defeating blocks, disrupting both run and passing plays and assisting their teammates’ stats as much as it also credits players for helping their own stats, and the cumulative grades do a fine job of capturing each player’s contribution to production on a given play. PFF pass-rush grades, in particular, have been one of the strongest measures of future NFL pass-rush performance since we started tracking in 2014, meaning high pass-rush grades are encouraging and lower grades should be alarming when attached to high-profile prospects. 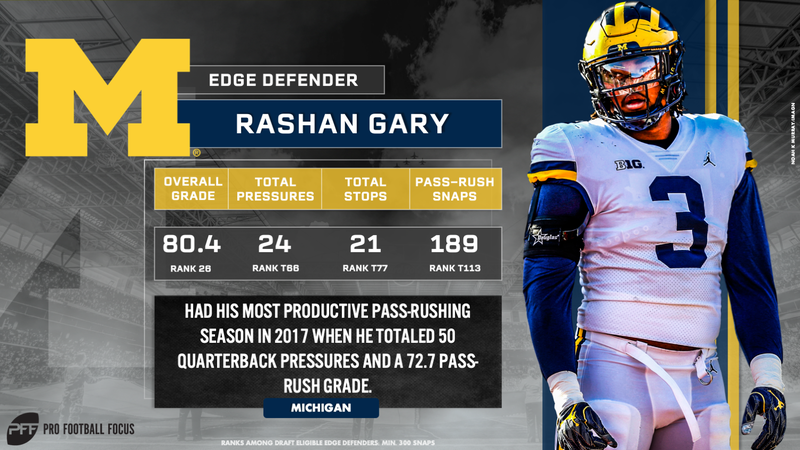 Enter Michigan edge defender Rashan Gary. 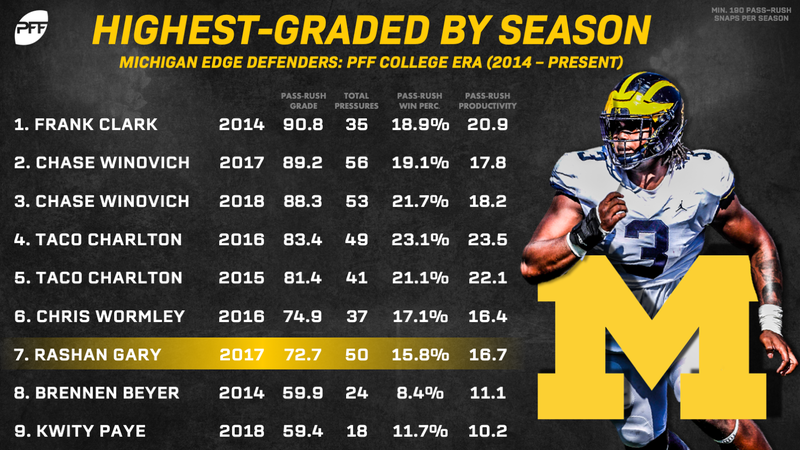 The former five-star recruit has incredible size and athleticism, dripping with “potential” and “upside,” though the on-field results have been good, not great, by PFF standards. Gary’s best overall season grade is 80.4, coming last year on only 353 snaps and his peak pass-rush grade is only 72.7, earned in 2017 on 341 rushes. Historically, the best college pass-rushers have had pass-rush grades upwards of 85.0, and players with a grade of 87.0-plus have done a far better job of translating to the NFL. Gary falls far below that standard, but like every number, it’s important to dig into the context. Defensive scheme can certainly limit a player’s opportunities, so it’s fair to ask whether or not Gary was limited during his time at Michigan. While he has been used on stunts and as more of a “decoy” on blitzes, Gary has had plenty of one-on-one opportunities to rush the passer in his three years at Ann Arbor. When we filter out plays with no blitzes and no stunts, Gary ranks just 64th among edge defenders in the draft class with at least 100 opportunities and only 30th among those with at least 250 rushes. His 68.8 pass-rush grade in such situations is just as concerning as his overall grading suggests, especially when his peers who are receiving similar first-round hype are all ranked among the top 15 in this situation. His own teammate, Chase Winovich, ranks 10th with a pass-rush grade of 84.5 in these instances, and Winovich outperforming Gary, both against the run and as a pass-rusher, has been a consistent theme during their time together at Michigan. While the general narrative around Gary is that he has the “traits” to develop at the next level, the proper question is why a 280-pound, outstanding athlete did not produce at the college level. When diving into the data, the picture looks bleak and Gary is one of the riskiest prospects in the draft, especially if drafted in the first round, particularly in the top 10.